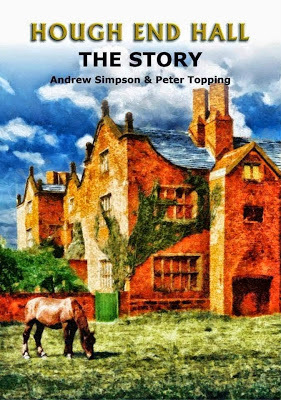 The book, Hough End Hall, The Story by Andrew Simpson and Peter Topping, was successfully launched earlier this month at the Chorlton Arts Festival. It tells the story of the Hall and that of the people who lived and worked there. That’s four centuries from when it was the new home of Sir Nicholas Mosley, through its 250 years as a farmhouse, its brief spell as a restaurant and right up to our present campaign to buy it and convert it into community use. You can buy it here for just £14.99 plus £2.80 postage (£5.30 overseas). Click the link below to purchase online, or see below for local outlets. You can also buy the book, in person, at Chorlton Bookshop on Wilbraham Road, or Chorlton Library, on Manchester Road. This entry was posted in Fundraising, News, The Book and tagged Andrew Simpson, Book, Book launch, Fundraising, history, Hough End Hall The Story, Peter Topping by houghendhall. Bookmark the permalink. I bought 2 copies of the book after the walk last Sunday, but the walk would have been more meaningful if someone had led the group around the exterior of Hough End Hall looking at the brick bonding, the diagonally-set chimneys, the mullion-and-transom windows, and much more. I could have done that myself.The lectures during the walk were so long-winded that some of this time could have been spent at the Hall. I caught 2 trains to get to Chorlton from Hebden Bridge, so my day was wasted because there was nobody to educate the group about the architecture of the Hall. I am not a total stranger and did send a donation earlier this year. I give illustrated talks on the vernacular buildings of Lancashire, and often include Hough End Hall. Please include the architecture at any future events. Thank you Kevin for your helpful comments and for your continued support. Your idea of a talk specifically about the architecture is a great one, and we will get back to you if we are able to organise this, as you know so much about this. Thanks again. Pingback: Latest news about Hough End Hall – it’s being sold. | Hough End Hall: Let's make it ours!